to support the awareness of breast cancer. someone who has had this experience. And our hearts go out to them. with a delicate pink rose on the side. leaves lying on my path during my walk earlier today. adorning the newly fallen leaves. The brightly colored fall leaves are wondrously beautiful to me. This lovely trio was manufactured by Hammersley. An English Pottery that was located in Stoke On Trent, England. handily supplied here on her backstamp. Hammersley was a fine company that began in 1887.
beginning his own company Hammersley and Co.
and you no longer see their backstamp anymore. 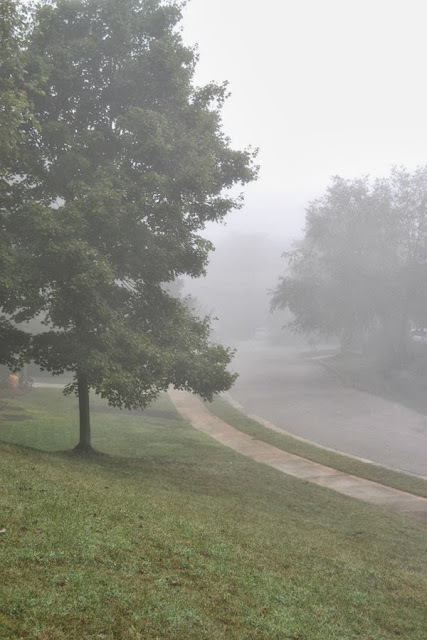 It has been dark, rainy and misty here for a while now. I took this image last week, the leaves had not yet begun to turn. After such a wet summer, I really am surprised at the wet fall too. Who knows...maybe there will be *snow* this winter? but I will be there for sure soon. I like your teacup with the roses Terri. After my walk this morning I stood admiring the carpet rose bushes along the front walkway that are still blooming, and loaded with buds. With all the rain we've had this summer, I'm thinking we'll have a lot of snow during winter. To be expected here, but sounds exciting for you. Hooray! Finally got through! Hope the issue is resolved. I love the vivid colors of your teacup, and it is so autumnal. Perfect! Thanks so much for hosting, and hope you are enjoying a bit of a break. It is a beautiful tea cup. 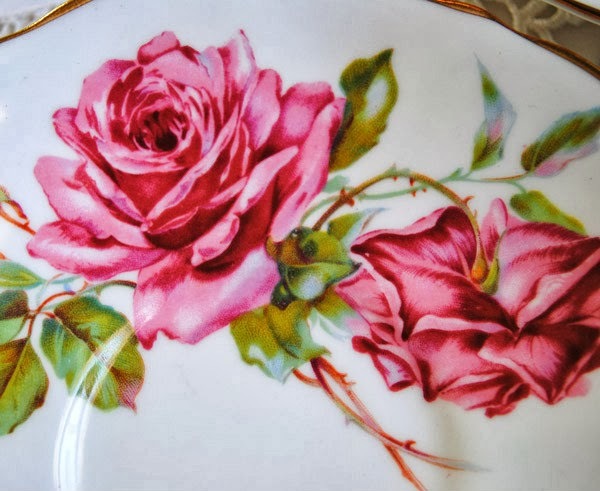 I love roses on china. What a pretty teacup you have chosen for this post! 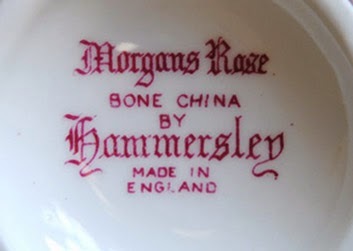 The Hammersley name is one that I do not have in my collection. I guess I simply haven't run across one yet. The colours of the roses are perfect for all three seasons just as you said. Thank you for sharing this beauty with us. I love Tea Tuesdays! Enjoy your week wherever you are, my friend. 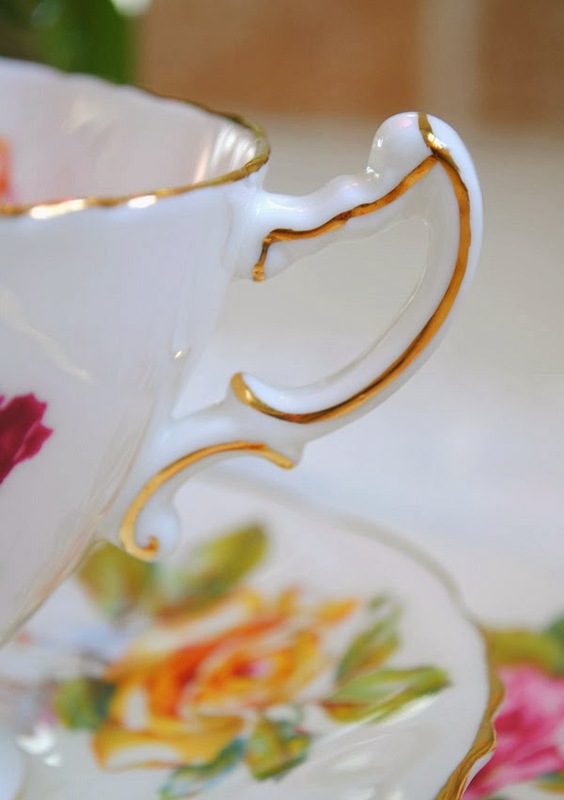 Hi Terri, love the tea cup that you are showing today. I usually like soft colors but, this one is gorgeous. Wishing you well in your re or gazing your art room. You must show us once it's all done. Terri I love the vibrant colors in these teacups too. This is a lot like the choice I made this week. Thank you for hosting! This cup and saucer and plate are very pretty. I have never seen these pieces and you have a real treasure! Just lovely! 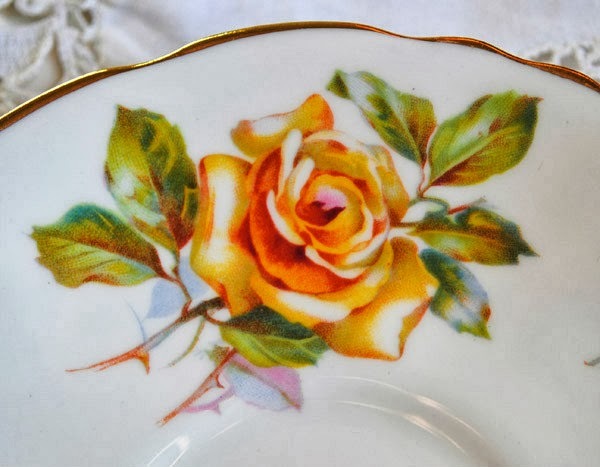 What a beautiful teacup and saucer with hues of velvety roses. The elegant shape of the "7" has pretty gold trim. Hammersley has always been a wonderful designer of tea sets and this pattern is a great example! Have a terrific week! 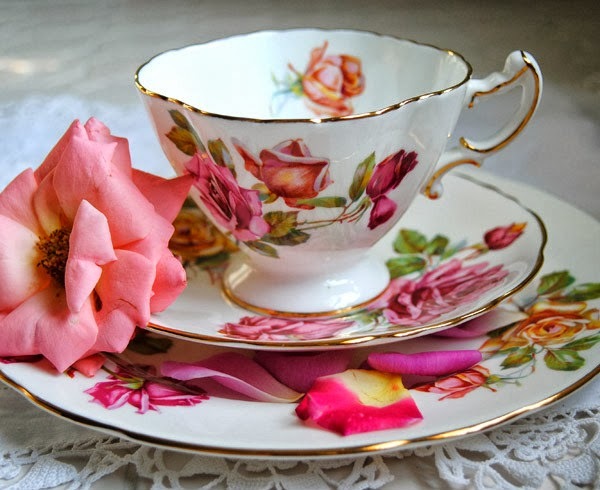 I loved the tea set you chose for this special pink tea with the vibrant roses and the "fancy 7" handle. It's really beautiful and your last photo is amazing! I also found very interesting the information about Hammersley & Co. Such a lovely tea cup Teri. Thank you for hosting. I will be definitely joining you shortly. Quelle est belle cette tasse! 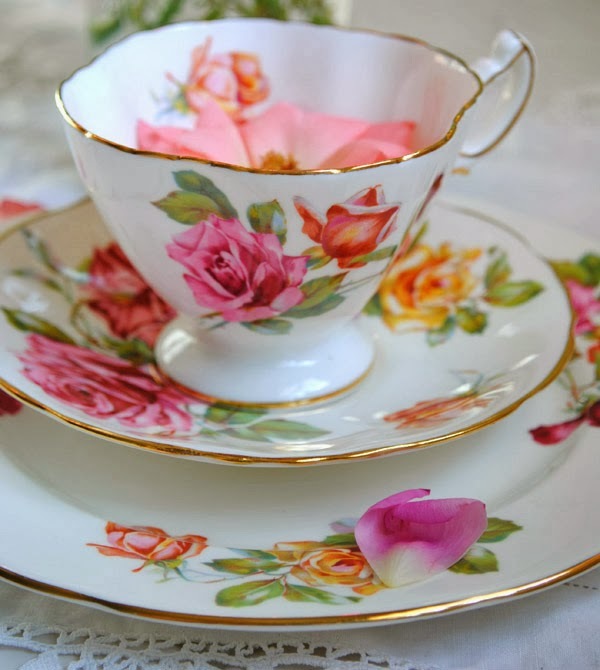 Love your choice of teacups and roses. Charming tea of roses..so pretty..I will miss the roses of summertime too! Until next year! Wonderful images my friend..dreamy and poetic!! What a lovely teacup and a trio too! We have had a beautiful mild fall so far. Thank you for hosting! The colors are incredible.. Reminds me of our sunsets. My o my is that a pretty tea cup. How elegant is the shape and the decoration is just wonderful. To be honest, I have never heard Hammersley before but it high quality as I can see. Thank you for sharing this wonderful autumn roses, dear Terri. And for hosting this sweet event. This is a very delicate teacup. It does remind me of summer on that rainy day. Hi Terri! Best to you on your art room re-do. I seem to be doing that on a weekly basis of late. Tried to make things work in the basement room - but I need windows. Currently, I've redecorated my living room and dining room and such clever little spots my art supplies are tucked in so I can set them out and put them away in a trice! My back sewing room keeps the lionshare of things - but comfy work in the center of my home is where inspiration happens. Your cups are stunning - as usual. I love your photography - always inspiring. Joy to you as you move forward in this season! love this cup and the almost finished roses, c'est la vie...and it is as beautiful as a fresh rose. We had not only a beautiful summer but a real "indian summer" the last weeks.. but nou it is getting colder and rainy... I wish you a very beautiful weekend! Hi Terry, oh I do believe your teacup is one of the most lovely I have seen in a long time. How perfect for the last rose of summer. Your pix are the best! What kind of camera do you use? Nice and warm here ...in the 70's! Sunny too,so it's just so wonderful. What could possibly be better than teacups and roses combined?! The teacups are heavenly. J'étais émerveillée en parcourant votre blog, voir d'aussi belles tasses à thé m'a épaté. Félicitations pour touts ces beautés. J'ai vu aussi un très beau "tea cosy" que je collectionne moi aussi.